I love the fresh and clean taste of Vietnamese Summer Rolls. I have become a bit addicted to them lately. My favourite place in town serves them for lunch and I must admit I go there quite often. I also regularly make them at home for dinner. They are so easy and quick to make and you can use all your favourite ingredients. Basically, you can use anything you have in your fridge and combine as you like. Vietnamese Summer Rolls are also fun to eat and share with friends. 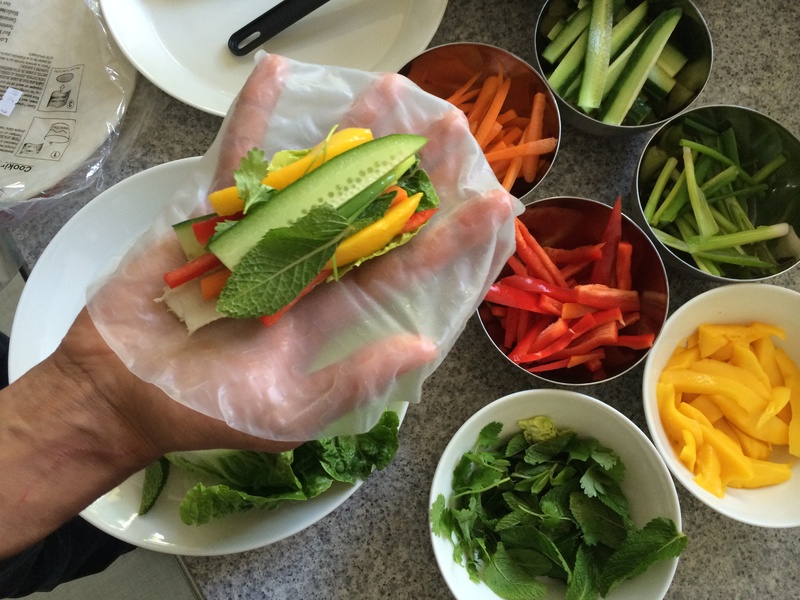 You can lay out all the fresh ingredients on the table and let everyone create their own summer rolls. You can serve them with different dipping sauces so everyone can make them completely to their own taste. To me, fresh summer rolls are the ultimate comfort food. I love the fact that they are so healthy too as you’re using only fresh ingredients. I also love all the different textures and flavours. Using fresh herbs adds a very fresh and clean taste. My favourite combination is fresh mint and cilantro but you can choose any herb or herb combination you like, like fresh basil, dill, Thai basil, betel leaves, lemon balm and chives. I also love to add a sweet element, like thin slices of firm fresh mango or papaya. Avocado is also a nice addition as it adds just a little creaminess to all the crunch elements. Feel free to experiment and create your own flavour combinations! That’s the best part of it all. For the Spicy Peanut Sauce, add all ingredients for the spicy peanut butter sauce, except for the chili, garlic and ginger. Mix thoroughly. In a mortal and pestle, crush the red chili pepper, ginger and garlic until you have a fine paste. Mix the chili, garlic and ginger paste into the peanut sauce. Add more water if necessary to create a smooth dipping sauce. Rolling your fresh spring rolls is an art in itself and may take some practice at first. If using dried rice paper wrappers, fill a large bowl with very warm water. Soak one rice wrapper at a time, until softened and flexible. Lay the softened wrapper flat on your hand. 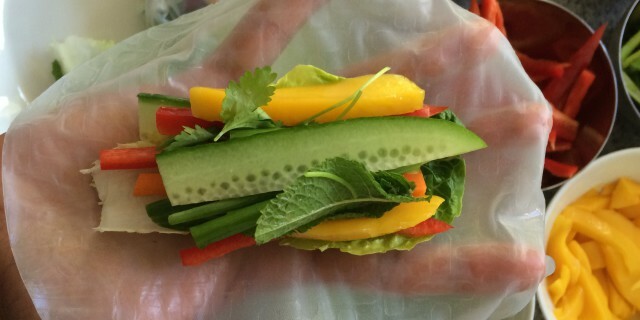 Add a baby Romaine leaf first, then your mango and avocado sticks and then add your fresh herbs and all the crunchy elements (bean sprouts, carrots, bell pepper, daikon, cucumber etc.). You want to have most of the crunch in the center. Then add another layer of mango and avocado sticks and carefully roll up as tightly as possible, starting with the left and right side first. Then fold up from the bottom and fold the top down. Serve with Spicy Peanut Butter sauce and sprinkle chopped roasted peanuts and/or cashews on top. Serve the summer rolls with the Spicy Peanut Sauce and sprinkle roasted peanuts or cashew nuts on top. Enjoy your Vietnamese Summer Rolls!